Definition: A Balance Sheet refers to the position statement, which lists out the balances of the assets, liabilities and owner’s equity, i.e. capital, of an enterprise at a specified date. While the assets show the resources owned by the company, liabilities and capital exhibits the funding of resources. The preparation of Balance Sheet is not for a period, but at a particular date. The preparation of the balance sheet is possible only when profit and loss account for the period is prepared because it reflects the financial position of the company adequately. That is why the Profit & Loss Account, Balance Sheet and Cash flow Statement are collectively called as Final Accounts. The totals of the two sides, i.e. assets and liabilities of the balance sheet must tally as Assets = Liabilities + Capital. If not so, then there must be an error. 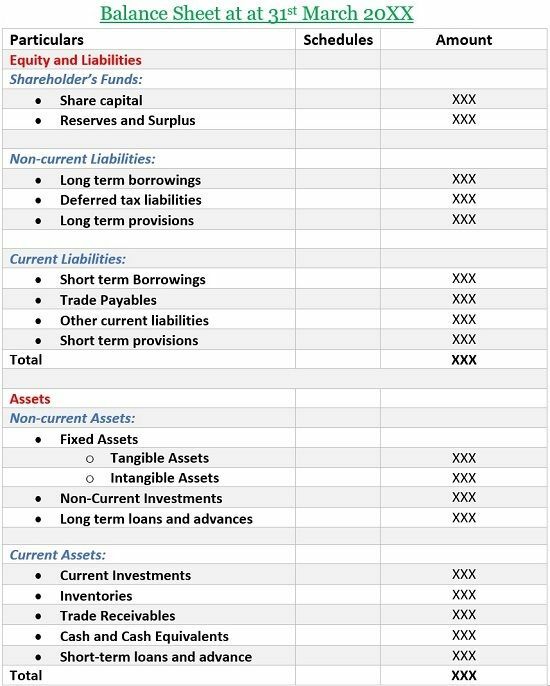 The balance sheet reflects the nature and value of assets and liabilities and the position of capital on a given date. It can be prepared, taking into account the debit and credit balances of the real and personal accounts, as per trial balance. The real account’s debit balance is an indicator of the asset of the firm, whereas the credit balance of the personal account is an indicator of liability. Equity and Liabilities: It indicates what the firm ‘owes’ to others. Shareholder’s Funds: It shows the shareholder’s contribution to the firm in any form. Share Capital: The portion of the firm’s capital, raised from the issue of shares. It encompasses equity share capital and preference share capital. Reserves and Surplus: It covers retained earnings and shares premium. It encompasses capital reserves, debenture redemption reserves, general reserve, revaluation reserve and surplus. Non-Current Liabilities: The liabilities which can be settled after one year from the date of reporting, is called non-current liabilities. Long-term Borrowings: Term loans from banks and financial institutions which have a tenor of more than a year are called long-term borrowings. Deferred tax liabilities: A deferred tax liability arises when the amount allowed for tax purposes exceeds the charge in the financial statements. Long-term provisions: Provisions for employee benefits comes under long-term provisions. It includes provident fund, leaves encashment, gratuity, superannuation fund, etc. Current Liabilities: These are short-term liabilities which need to be settled within a period of one year or less. Short-term Borrowings: The borrowings that are to be repaid within one year is called short-term borrowings and includes commercial paper, working capital loans, corporate deposits, etc. Trade Payables: The amount due to suppliers from whom goods are bought on credit are called trade payables. It includes sundry creditors and bills payables. Short-term provisions: It refers to the provisions made by the firm for dividend and taxes. Assets: These are the resources owned by the firm, that provide future economic benefits. Non-current Assets: The assets which remain with the entity for more than a year are non-current assets. Fixed Assets: Assets bought by the company for long-term use, and are not converted into cash quickly are called fixed assets. Tangible Assets: The assets that are used in their physical form are called tangible assets. It includes land, building, vehicles, furniture, plant, etc. Intangible Assets: Assets with no physical shape and structure are called intangible assets, such as copyright, patent, trademark, design, software, etc. Non-current Investments: It consists of financial securities of other companies such as shares, debentures, bonds and so forth. Long-term loans and advances: Loans and advances made to subsidiary companies, associate companies, comes under this category. Current Assets: The assets that can be converted into cash within a period of one year or less are current assets. Current Investments: The holdings in shares of mutual funds, usually for a short term are called current investments. Inventories: It refers to the stock of goods in various forms such as raw material, work-in-process and finished items. Trade Receivables: The amount owed by the customers to the firm, to whom goods are sold, but not yet paid. Cash and cash equivalents: It includes cash owned by the company and the credit balance with the bank and financial institutions. Short-term loans and advances: Loans and advances provided to parties such as suppliers and employees are covered in this category. As each and every transaction affects assets or liabilities of the business, that is why, the balance sheet can be regarded as true only at that point in time, when it is prepared. And due to this very reason, “as at” is written with the date. Usually, it is prepared on the last day of the accounting period.